Green and Glassie: Fun Halloween Weekend! Super easy Halloween Costumes to make! 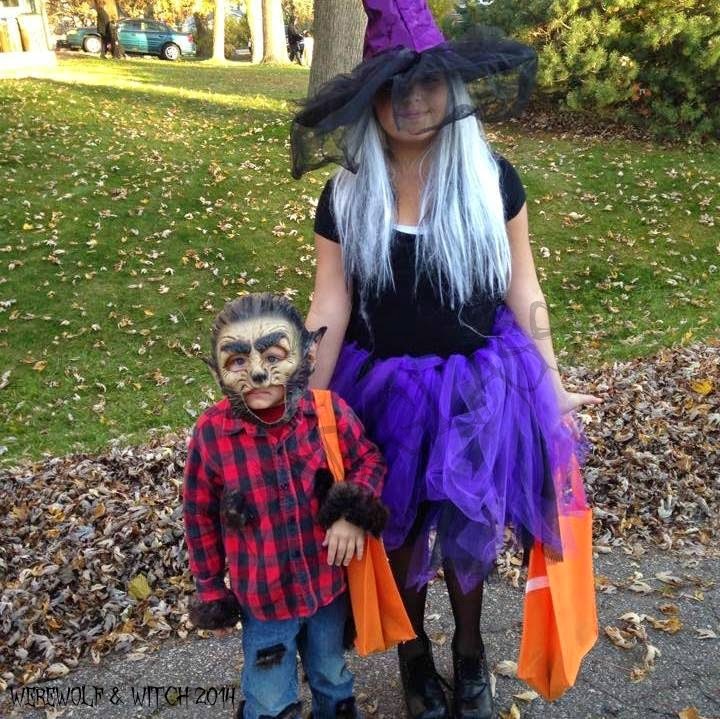 TuTu Witch and Werewolf ... check out Isa and Davey! Dawn purchased the werewolf mask - witch hat & wig - twill for tutu, black fishnet tights, and fur for werewolf. Tie twill around a belt to make the tutu and decorate the hat - use clothes to make the costume for the witch. For the werewolf glue fur to a old pair of pants and shirt. Thanks Michael's for offering fun free family projects. I love those classes they offer at Michael's. Their bags came out great and I love their costumes. We did a few classes during the summer at Michaels. Love their Halloween bags, they did a great job! 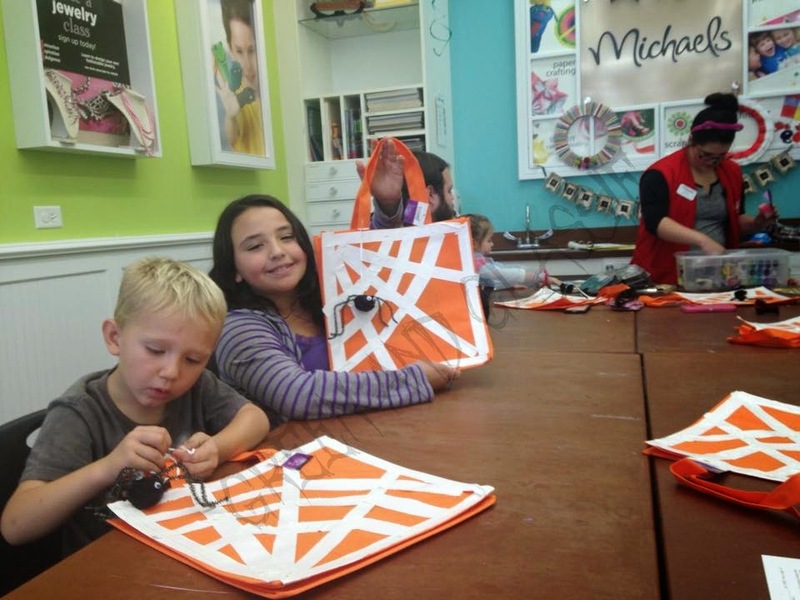 The kids really did do a great job on their bags! Those costumes are both fantastic! The kids look awesome! I need to look into if our local Michael's offers those free family craft classes. I'm sure my daughter would love it! They look fantastic! I love the tip about using the fur to make the werewolf costume more real. Those Michael's craft classes are awesome! Oh wow. This turned out really cute. thats a really great werewolf mask. I love how adding a tutu to anything creates a new costume. I'm a big fan of the witch costume tutu also. The kids sure look cute! I had no idea Michael's offered a craft class. We usually do the woodworking class at Lowe's. That's really great! And this is why I love home made costumes. They're always so creative. I love the tutu witch! Those are so crafty and so fun, most important they look pretty easy too. Home made costumes are the best! So creative! Their costumes are adorable! Don't you just love those Michael's classes. They make the neatest stuff. Those costumes are absolutely adorable! And I hope those cute bags get filled with lots of candy! I love Michael's free craft time! Also am in love with the werewolf.. That FACE!!!! I love it when Michael's offers those free classes. We missed the bag craft, but I am glad you shared yours. They turned out great! Those costumes are really cool and look great too! My kids are all going as something scary this year! I absolutely love that little werewolf! He is the cutest werewolf ever in that little plaid shirt with the fur patches! The werewolf costume is super cute! I love making costumes for my kids because I can get more creative than storebought. Oh wow. I love their costumes! I can't wait, Halloween is so close to finally being here. My youngest is going to be a magical princess witch. My oldest daughter insisted on being a pink Power Ranger. Great costumes. Kiddo is a music teacher this year, from the 50s. She has a poodle skirt and blonde wig. So cute. Most homemade. We do not do halloween but that is one cute little werewolf! Adorable! If I only could get away with making my teen a costume like I did in her younger days - I'd be happy -very happy! Both costumes are really great. I like how easy they are to make yourself. They look fantastic and the crafts look quite fun. So much fun! My kids would love those bags! I need to check out our Micheals for classes. They look great. I may have to show my youngest the werewolf costume, he still needs something, and that looks like something he would really be into. I always go to Michaels for arts and craft. Your kids' costumes look great! I also love the fun Halloween craft! Cute costumes and those tote bags look like so much fun. Gotta love crafts at Michaels. Wee do not celebrate Halloween, but we do like making crafts together as a family. Those are fun! I love simple costumes like that ;) I wish we had a Michaels closer than an hour away. Whenever I go see my family I stop in there. These costumes look great i like home made options. It can be expensive to buy new costumes every year. These are really good looking costumes - I'll have to keep these in mind for next year. Those costumes are super cute! I also love the bags! I always forget that Michael's does that! Oh I love those bags and the fact that they were a craft you all did! Super cute. I am all about DIY and the costumes that you make yourself always leave a lasting impression. Your kids look like they know their way around halloween! How fun! They look great! I haven't ever tried a DIY costume but I need to! I'm not crafty but think I could try! So cute. I wish we would have attended the Michael's bags. Looks like fun. They look way too cute! I love the spider webs on their bags! I love the costumes. What cute details. I can't believe this was a DYI project. I'm so not crafty but I think I might be willing to take a class at Michaels. That werewolf is the best. I hate to admit we don't have a costume for my little man yet! Too cute, I love those costumes! This is a great time of year! That is the cutest werewolf. :) I love the witch costume too. That could be fun for me as we make our rounds through the neighborhood. Looks like you all had a lot of fun! Everyone looks so adorable! wow, those bags came out so cute. Aww they look so cute. I don't think I knew Michael's has free shops, I'm going to look into that here. I love the werewolf mask! Those are adorable. Isa and Davey are adorable! Those treat bags are super cute! The bags are really cute. And the costumes are adorable.